Yeeeaaaahhhh! A style post! After a wee break and starting to get the hang of this working full time for other people thingy, I finally have some inspiration and am back to blogging! DId you miss me? I sure as hell missed you. When I was a kid, I had this picture book that was a story about an animal that was blue. It went to visit a lady who lived by the ocean and only ate things that were coloured blue. It ate her curtains, flowers, dresses, china — everything, as long as it was blue. I’m pretty sure they lived happily ever after, and I can’t for the life of me think what the book was called (Mum? Can you help?). Really the book is of no significance aside from the fact that I was reminded of it while compiling this style post. And I am so glad I did so I can hunt it down as it was an absolute favourite. So this week, all about blues. I have the Swonderful ‘Vegas’ skirt (1) and I wear it constantly. Not sure I’d be brave enough for the hair (2) but it looks so good with the blonde! When wearing blue, there are so many shades, there is always a right one for everyone. 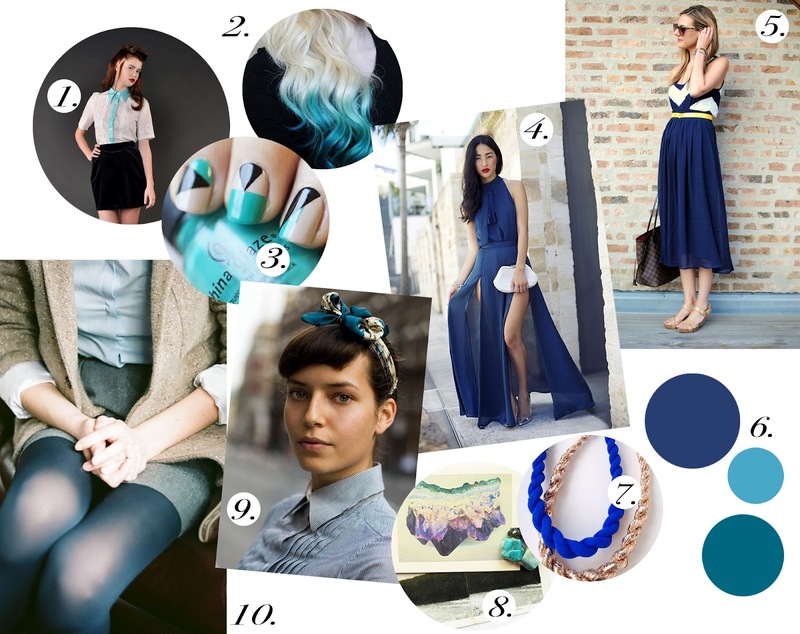 I love navy at the moment, mixed with a pop of colour like mustard or yellow. Wear a little with a chambray shirt (9) or a lot like this magnificent dress! (4). Hope you’re enjoying the style posts again, I promise I won’t leave it so long next time.